PhotoEye@NVC 2019 Lecture Series welcomes... Paul Son! Lamia Khorshid to speak at PhotoEye Spring 2019! We are pleased to announce our next PhotoEye lecturer...Lamia Khorshid! Please join us on Thursday, February 21, 2019 for her talk! 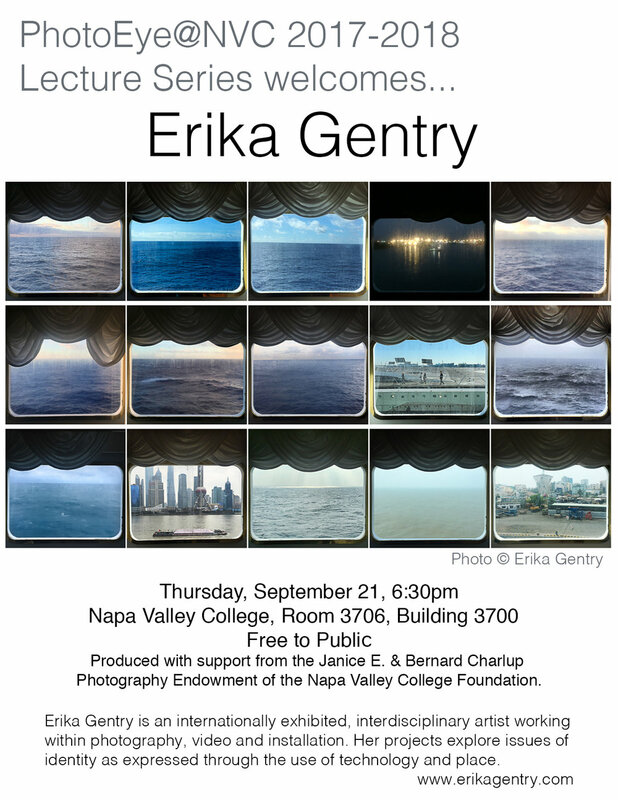 Produced with support from the Janice E. & Bernard Charlup Photography Endowment of the Napa Valley College Foundation. Lamia Khorshid is an Egyptian born artist, educated in the U.S, residing in San Diego, and spending summers in her adopted country of Italy. She holds a Master of Fine Arts and a Bachelor of Architecture from the University of Miami. Her work is exhibited nationally and internationally, with recent solo shows in San Diego in 2017 and Florence, Italy in 2013. She teaches at MiraCosta College and Southwestern College in San Diego, after teaching at the University of Miami from 2007 – 2015. In her work, she is interested in how the built environment and “place” re-contextualizes our overlapping connections to home, country, religion, and history. We are pleased to announce our next PhotoEye lecturer...Meri Page! Please join us on November 15, 2018 for her talk! We are pleased to announce the upcoming speaker for PhotoEye 2018-2019 is Sant Khalsa!! Please join us on Thursday, September 20th, 2018 at 6:30pm to welcome Sant Khalsa. The lecture will take place in Building 3700, Room 3706, and is FREE to the public. We are pleased to announce the upcoming speaker for PhotoEye 2017-2018 is Alice Shaw!! Please join us on Thursday, April 19, 2018 at 6:30pm to welcome Alice Shaw. The lecture will take place in Building 3700, Room 3706, and is FREE to the public. We are pleased to announce the upcoming speaker for PhotoEye is Bessma Khalaf!! Please join us on April 20, 2017 at 6:30pm to welcome Bessma Khalaf. The lecture will take place at the Performing Arts Center, Building 100, Room 133. PhotoEye is produced with the support of the Janice E. & Bernard Charles Photography Endowment of the Napa Valley College Foundation and co-presented by di Rosa. Khalaf earned her B.A. from San Diego State University, San Diego, CA, and M.F.A. from the California College of the Arts, San Francisco, CA. Her works have been exhibited at Jack Shainman Gallery, New York, NY; Steven Wolf Gallery, San Francisco, CA; Southern Exposure, San Francisco, CA; Gallery Four, Baltimore, MD; 18th Street Arts Center, Santa Monica, CA and the ISE Cultural Foundation, New York, NY. Khalaf has been the recipient of a Murphy Cadogan Fellowship and the Vision From The New California Award in addition to a residency at the Kala Art Institute. Her work has been featured and reviewed in publications such as Zyzzyva, Artforum, the San Francisco Tribune and Baltimore City Paper. Khalaf is currently represented by Steven Wolf Fine Arts, San Francisco, CA. Valerie Mendoza was born in the Bay Area and taught part-time at the San Francisco Art Institute, U.C. Santa Cruz and Civic Arts Education before accepting a position as an Assistant Professor with the University of Florida in 1999. She lived and worked in Florida for five years. She has been an Assistant Professor with San José State University since 2004. Mendoza received an MFA from the California College of Arts and Crafts in 1995, and a BFA from San José State University in 1992. She has exhibited internationally, with installation and video work included in Ars Latina 2007, at the Centro Estatal de las Artes in Mexicali, Mexico (June 2007), Site, Intervention, Identity at the Limerick City Gallery of Art in Limerick, Ireland (2004), and the 16th Annual Festival International Du Film Vidéo, Vébron, France (2003). Recent national exhibitions include Her Shorts, with the Plugged Women’s Video Collective in Tucson, Arizona (May 2007), Tergloba at the Meadowbrook Art Gallery in Rochester, Michigan (March 2007), Illegal Entry featuring the work of 5 artists addressing border issues at Galería de la Raza in San Francisco, California (May, 2006), Packed, an exhibition featuring the work of artists from Ireland and the US at Mercer University in Macon, Georgia (February, 2006), the 8th International Open at Woman Made Gallery in Chicago, Illinois (March, 2005), En Masse, San Francisco Camerawork, San Francisco, California (March, 2005) and The Art of Illness: Examining the Biomedical Paradigm at Southern Illinois University, Edwardsville Museum Gallery (January, 2005), among many others. Please come see Norma I. Quintana on Thursday, September 15th at Napa Valley College for PhotoEye@NVC 2016-2017 Lecture Series! More information soon! Geir and Kate Jordahl to speak at PhotoEye@NVC 2015-2016 on April 21st! Geir and Kate Jordahl to speak at Napa Valley College for PhotoEye@NVC 2015-2016 Lecture Series! Geir and Kate Jordahl are award-winning editors and photographers. They bring their love of books and passion about images to the creation of a variety of visual projects. Kate is a professor of Photography at Foothill College, Los Altos Hills and Geir is Director of PhotoCentral Programs, Hayward. They are educators, workshop leaders, curators and images makers. Their work is in many collections and they exhibit globally. They founded “True North Editions” in 2012 as a collaborative effort to give voice to unique work by artist working authentically. They have worked together as a team since 1980 and their work is represented by Modernbook Gallery, San Francisco. Their book projects include “Searching for True North" with Modernbook Editions, “Native American Ceremonial Dancers” and “The Village: Bill Owens – Jamaica” as well as the “one poem” books published with Dreaming Mind Studio. Awards include a Gold Medal/Best of Show in the PubWest Book Design Awards, a Silver Medal in Prix de Paris and in the Independent Publishers Book Awards for "Searching for True North" and a Silver Award Photography and a Bronze Award Art in the PubWest Book Design Awards for "Native American Ceremonial Dancers." PhotoEye@NVC is a quarterly photo lecture series organized by the Napa Valley College Photography Department featuring in-person presentations by noted photographers and other contemporary image makers in which they are invited to share their ideas and artistic practices with students and the general public.